Filing onstage to the Doors' "Riders On the Storm," the National took their places for what was one of the evening's most anticipated sets. Those with high hopes were not disappointed. 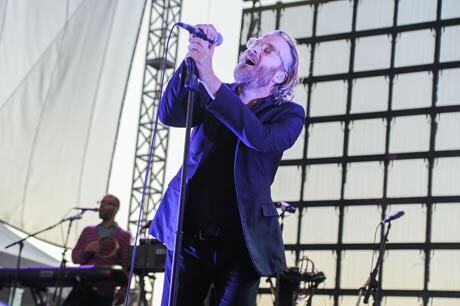 A black-clad Matt Berninger looked suave as he ambled about the stage, playing the part of frontman effortlessly. Backed by one of the weekend's flashier light shows and flanked by the Dessner twins (who seemed happy to take on the role of leading clap-alongs throughout the show), Berninger stormed through a Trouble Will Find Me-heavy set that included opener "Don't Swallow the Cap," "I Should Live in Salt" and a gorgeous, slow-burning rendition of "I Need My Girl." High Violet was prominent too, with "Bloodbuzz Ohio" wowing onlookers early on, "England" making sad music a delight to watch, and another track from the 2010 record arriving in time for particularly fantastic finale. The Boxer's "Ada" was given the live treatment, as was "Fake Empire" — which grew from the opening piano chords into a climactic number that let the Dessners show off on guitar, while the dazzling sounds from the brass section washed over the giant crowd. "Mr. November" and the aforementioned "Terrible Love" served as a double-header finale, with Berninger leaping from the stage and making his way deep into the audience, alternating between running across safe ground and surfing atop fans' hands, all the while belting vocals. It's a gimmick the band's employed for a while now, but one that continues to inspire awe (and lots of pushing) amidst the audience. A class act and passionate performer (from dropping to his knees during "Graceless" to his voice breaking as he screamed "Squalor Victoria"), Berninger was ever the enigmatic showman. The National know what they're doing live, and they've been honing the particular act they brought to Riot Fest since releasing Trouble Will Find Me last spring. But the lack of new material was a miniscule flaw for a band that otherwise delivered one of the weekend's finest sets.